More than a month later, Portland Public Schools (PPS) decided to put Riser on indefinite leave—alleging that Riser instigated the “unauthorized” walkout which put students’ lives at risk. 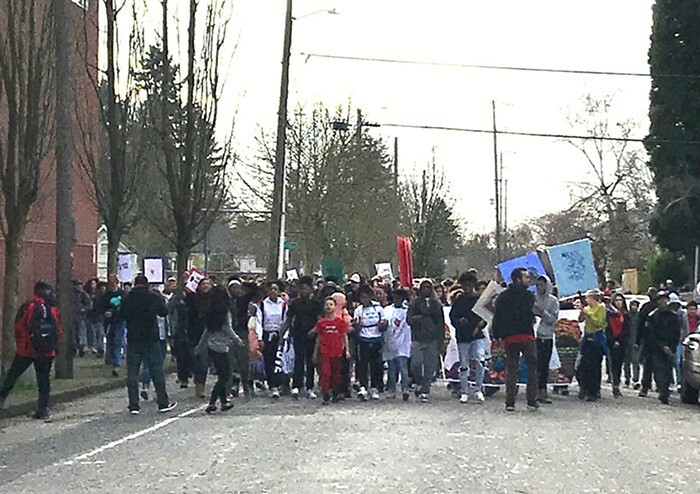 PPS was particularly incensed by a staged “die-in,” in which students lay down in a busy, blocked-off intersection to represent the many lives of Black kids lost to police related violence. While other staff members and teachers took part in the walkout, Riser was the only one PPS chose to put on leave. In response, Ockley Green students, teachers, parents, and community members have directed a wave of intense criticism at PPS, upset by the beloved teacher’s removal and accusing the district of mismanagement. Following this pushback, PPS reversed its initial decision to fire Riser and has vowed to further investigate the situation. The district’s last-minute reversal underscores the power of community opposition and shines a light on larger, systemic problems in the district. PPS initially said its decision to put Riser on leave was based on the walkout posing a risk to student safety. Others suspected his suspension has more to do with Riser’s race, his political stances, his criticism of the district, and his discussion of contentious social justice issues during class. The February walkout was partly coordinated by local Don’t Shoot Portland activist Teressa Raiford, who says the school’s Black Student Union asked her to help organize the protest. According to Raiford, Riser had nothing to do with leading the protest, and, along with other teachers and staff members, was only there to support the kids. Students agree. “It was a lot of teachers who joined in, so I really don’t know if it was just him,” says sixth grader Mya Smith, who attended a student protest in support of Riser before school on April 2. Multiple students said Riser was protecting them during the march rather than putting them in danger. Raiford thinks the reason PPS targeted Riser has to do with him being one of the few teachers of color at Ockley Green. “[Riser] is the only person who was put on leave, and he was the only Black person there,” Raiford says, adding that she believes the district is attempting to intimidate and silence other socially conscious teachers. “It’s disgusting,” she says. Riser has denied media interviews, citing the ongoing investigation. According to community members, Riser’s ousting is a piece of a larger problem at Ockley Green—one that began the summer of 2016, when the school, which formerly served students in kindergarten through eighth grade, transitioned into a middle school. Teachers and parents tell the Mercury that the transition took place with little assistance or guidance from PPS or district administrators, allowing numerous issues to go unresolved. “I don’t have any faith in the school district anymore,” says Aaron Smirl, whose son is a seventh grader at Ockley Green. “They rotate principals around so much that none of them ever really get attached to the community. And I personally think that’s by design.” In addition to believing that Riser’s suspension was intended to silence an outspoken teacher, Smirl is concerned by the message students might get from the incident: During Black History Month, PPS punished a Black teacher for participating in a political action related to protecting Black lives. Chu believes Riser’s punishment “wasn’t about the walkout; it wasn’t about student safety; it was retaliation,” and that the district’s “way to solve problems is to throw someone under the bus.” He suggests that the person who should really be under investigation is Ockley Green Principal Paula McCullough, as she is ultimately responsible for the entire school. Last week, PPS spokesperson Dave Northfield told the Mercury he was certain Riser was the main instigator behind the walkout. Now, the district doesn’t sound so sure. PPS’ recent statements are a clear response to the outpouring of opposition from the Ockley Green community. As of the Mercury’s deadline, an online petition calling for Riser’s reinstatement had received over 4,000 signatures. There is still no comment from PPS on when Riser will return to work.